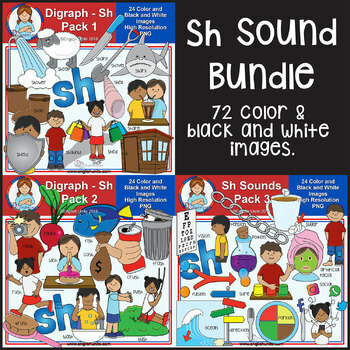 Clip Art - Sh Sounds Bundle (Sh Pack 1, 2 & 3): This set contains all of the images shown - 72 images (36 in color and the same 36 in black and white). The bundle includes an additional 36 images saved as darker line black and white images. Use the lighter line black and white image for larger images and the darker line for images what will be reduced. The images are saved at 300dpi in transparent PNG files. Images included from pack 3: artificial, direction, facial, fusion, ocean (saved with and without an arrow), portion, potion, social, sugar (saved with and without an arrow), sure, tension, vision and sh word art (bonus).